Dystopian novels are all too common, but utopian novels are another matter. Tropic of Kansas is a utopian novel set in a dystopian USA which has separated into warring territories, each intent on exercising control and keeping themselves fed and watered. The media is controlled and controlling, travel is restricted, information withheld. Of course, not everybody wants to be a citizen of a micro-state: dissent exists, along with encoded communication systems using old technologies, smuggling operations, alternative currencies and hidden societies. But this world is well hidden, somewhat disorganised, and prone to infiltration and suppression. The main story here concerns Sig, a free-wandering fugitive, in effect orphaned into living off the social network. He gradually finds himself deeper and deeper within the revolutionary heart of the underground, embroiled in scheming, fundraising and organising. Meanwhile, Tania, his long-lost foster-sister, who is a state operative, is sent to infiltrate the underground, tasked with finding out about and stopping the revolution that the state thinks is about to happen. Except, she ends up questioning what is going on and why the people she meets might want revolution, change and self-rule; just as Sig, despite himself, becomes more and more involved and motivated. (And of course they finally meet up.) There’s no easy utopia here, the revolution does kick off, but it is a violent and difficult one that slowly moves towards the possibility of change and some kind of fragile democracy, with people on both sides hurt, disappointed and dead. It is this sense of struggle and compromise that makes Brown’s book so believable. The utopian future here is messy, approximate and compromised. There’s no magic solution, no scientific or technological solution; people remain hungry, cold and angry. It is this, along with the adventures and subterfuge throughout the book that is so engaging and realistic. I haven’t read a more pertinent, relevant and doggedly hopeful book in a long while. 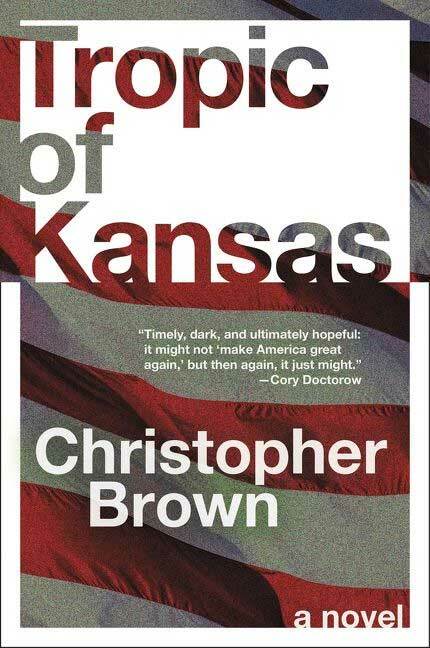 This entry was posted on 6 April, 2019 in homepage and tagged Christopher Brown, Rupert Loydell, Tropic of Kansas. Bookmark the permalink.